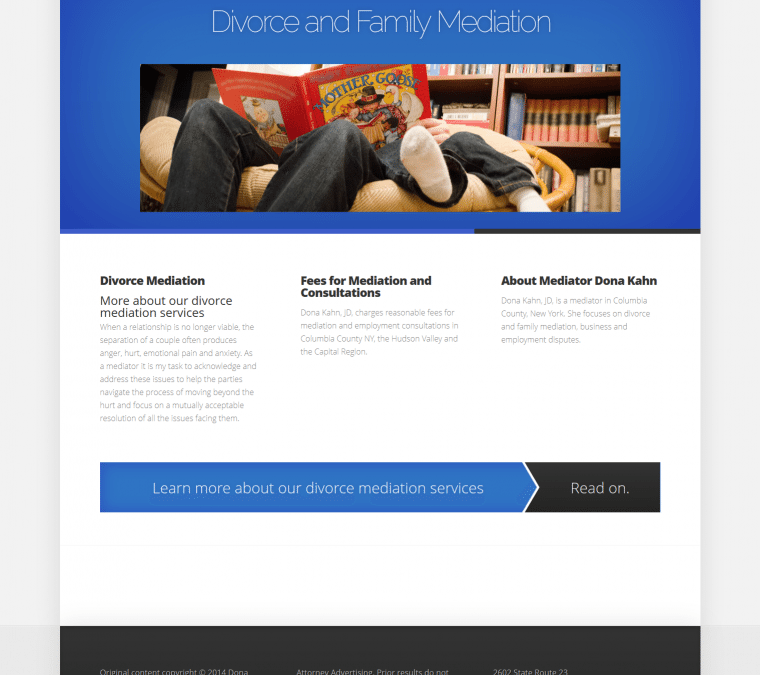 We designed a brand new website for Columbia County NY mediator Dona Kahn. Dona’s old website was a simple HTML affair, and looked rather dated. Her new WordPress website is attractive, built from the ground up to be ready for mobile devices and easy to navigate. We deployed a theme from Elegant Themes, a maker of top-notch WordPress themes. One of the reasons we are able to have such affordable fees is because we deploy ready-made themes made by theme experts. Rather than build a site brick-by-brick (which would take a lot of time and money), we take an existing strong structure and put up the drywall, paint the walls, and otherwise customize it to match the preferences of our client. Because the website already existed previously, we had to make sure to put in place what are called 301 redirects. These redirects ensure that visitors to the old website pages are automatically redirected to the new website pages. Failure to put into place redirects, particularly for sizable websites, can be a real problem. The lack of redirects sends many visitors to pages that do not exist and so they receive an error message. Search engines ultimately will punish websites with many errors. Dona’s website is ready for growth. Because it is a WordPress website, it is completely scalable. Her site is relatively small to begin, but can grow as her practice expands. We installed reliable plug-ins for additional site functionality, such as to improve site speed and security. Like many of our clients, Dona has elected to have us manage her website through our “managed care” hosting. We take care of all the website backend matters, like backup, security, software updating, and troubleshooting, so Dona can focus on her business. If you are looking for a divorce mediator in Columbia County, New York, check out Dona Kahn, JD.